The following case describes POF of the maxillary posterior attached gingiva and its treatment. 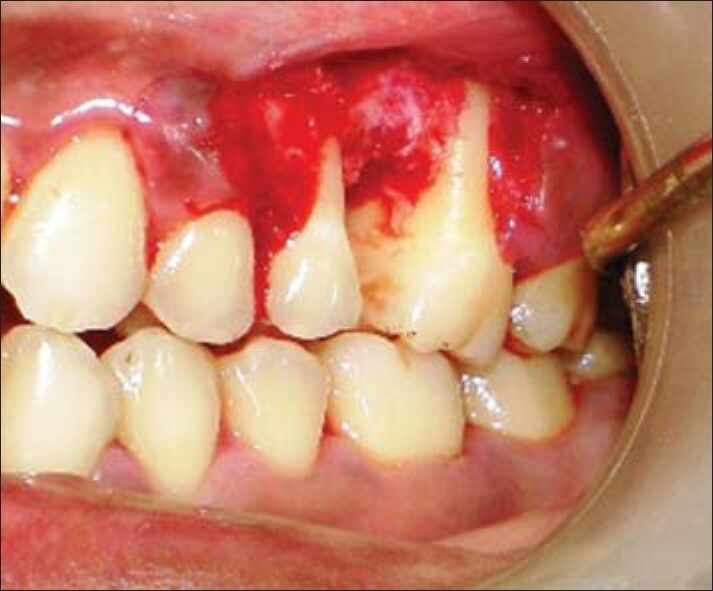 A female patient aged 32 years reported to the Department of Periodontics, Rural Dental College, Loni, with the chief complaint of bleeding and swelling in the buccal and palatal aspect of 25 and 26 regions since 6 months. The swelling started as a small growth and grew to the present size. It posed no other problems other than interfering with food intake. Bleeding was noticed with slight ulceration due to indentation of lower teeth on occlusal side which caused discomfort during mastication to the patient. Intraoral examination revealed a single, unilateral growth on buccal and palatal aspect of 25 and 26 measuring about 3.0 × 2 cm in diameters, reddish pink in color, somewhat oval in shape, firm in consistency with pedunculated base, and painless. The growth extended horizontally from distal line angle of 24 to mesial line angle of 26 and vertically from mucogingival junction, involving marginal gingiva and extending palatally to involve palatal mucosa as shown in [Figure 1] and [Figure 2]. The origin was seen primarily from interdental papilla with 24 and 25 regions. 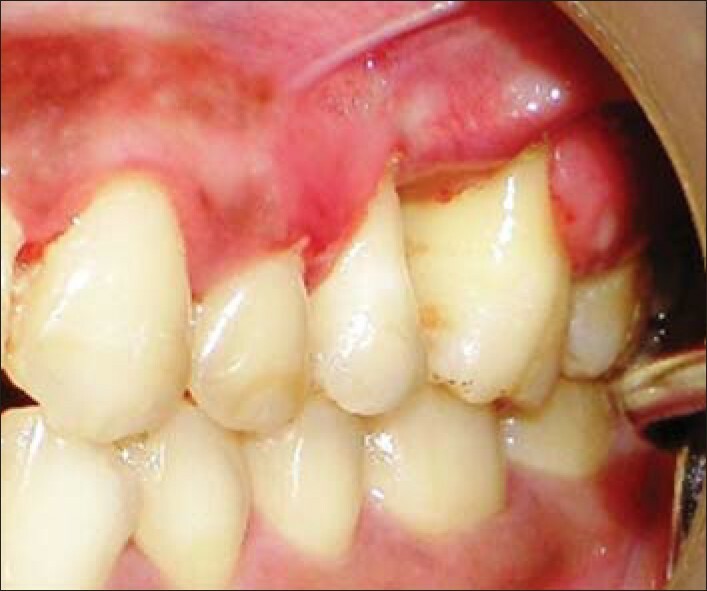 Evidence of erythema, ulceration, and intermittent bleeding was seen due to palatal indentation due to antagonist teeth. Color was slight reddish compared with adjacent gingiva. There was no pertinent medical history and further head and neck examination was unremarkable. A periapical radiograph revealed osseous defect with 24 and 25 regions. Differential diagnosis included pyogenic granuloma, irritational fibroma, aneurismal bone cyst, gingival cyst of adult, peripheral odontogenic fibroma, peripheral giant cell granuloma, and POF. Investigations ordered were intraoral periapical radiograph in relation to 24, 25, and 26 regions and complete hemogram. The radiographic findings showed mild angular bone loss, and hemogram revealed normal values. Thorough scaling and root planing was done and patient was put on maintenance phase. After 1 week, the growth was surgically excised under local anesthesia. A wide excision of the mass was performed, and the adjacent gingival tissues were plastied to create symmetrical postoperative gingival contours as shown in [Figure 3] and [Figure 4]. The biopsy was transported to the Department of Oral Pathology in 10% formalin for histological report. Section shows a parakeratinized stratified squamous epithelium with proliferation. There was forking and arcading of rete ridges. The connective tissues just below the epithelium were fibrocellular, made up of proliferating fibroblasts arranged in strands and whorls with areas of globular calcified masses resembling cementum-like material and osteoid tissue. Rest of the connective tissue was fibrocellular with blood vessels and chronic inflammatory cell infiltrate suggestive of POF as shown in [Figure 5]. Cundiff found a recurrence rate following excision of 16%, and Eversole and Rovin found a recurrence rate of 20% in 50 cases. Most probably, the incomplete removal of the tumor at the initial surgical procedure and failure to eliminate local irritants are responsible for its recurrence. In this case, recurrence was not observed after 1 year of period as shown in [Figure 6]. However, recurrences are easily managed with additional surgery. 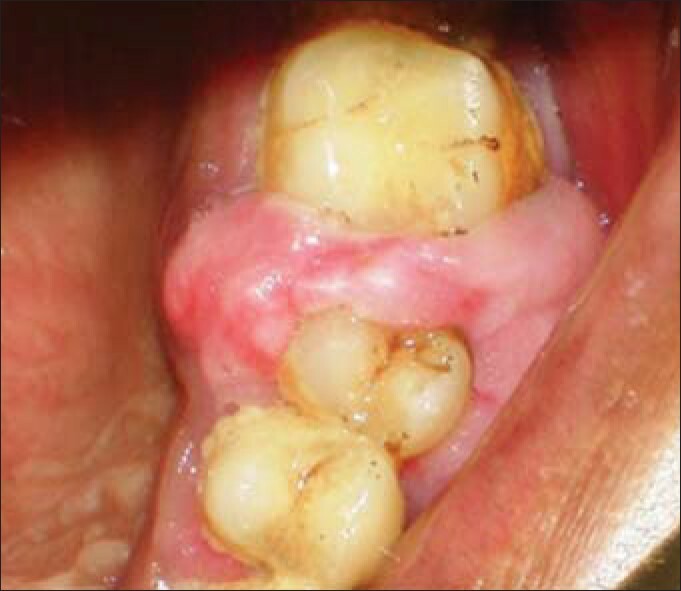 The POF is a well-defined pathologic entity among reactive gingival lesions. They are most common in females, found most often in the maxillary incisor-cuspid region, but may occur at any gingival site. As of the POF behavior pattern, a proper treatment protocol is warranted with close follow-up. 1. Michaelides PL. Recurrent peripheral odontogenic fibroma of the attached gingiva: A case report. J Periodontol 1992;12:645-7. 2. Kfir Y, Buchner A, Hansen LS. 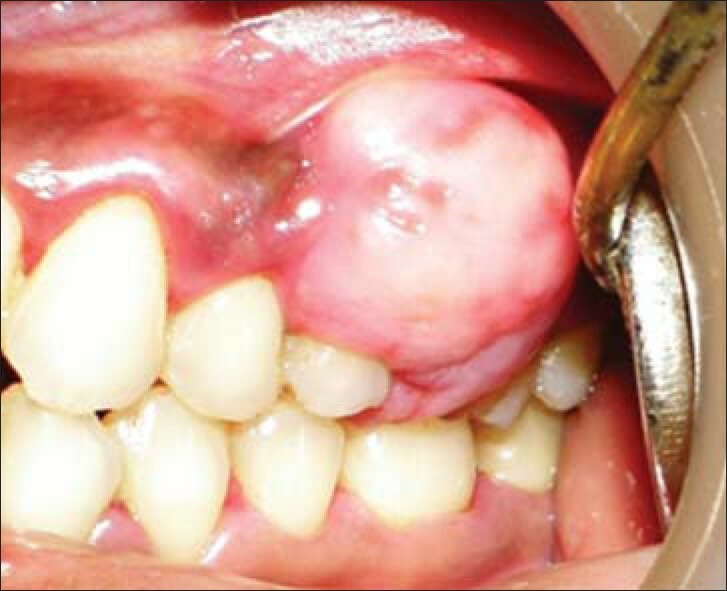 Reactive lesions of the gingiva: A clinicopathologic study of 741 cases. J Periodontol 1980;51:655-61. 3. Layfield LL, Shopper TT, Weir JC. A diagnostic survey of biopsied gingival lesions. J Dent Hyg 1995;69:175-9. 4. Bhaskar SN, Jacoway JR. Peripheral fibroma and peripheral fibroma with calcification: Report of 376 cases. J Am Dent Assoc 1966;73:1312-20. 5. Zain RB, Fei YJ, Fibrous lesion of the gingiva: A histological analysis of 204 cases. Oral Surg Oral Med Oral Pathol 1990;70:466-70. 6. Kenny JN, Kaugars GE, Abbeu LM. 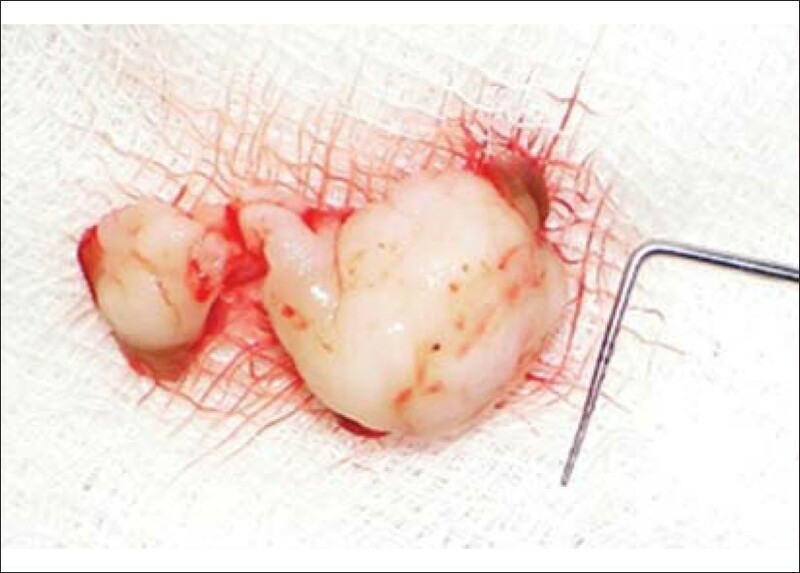 Comparision between peripheral ossifying fibroma and peripheral odontogenic fibroma. J Oral Maxillofac Surg 1989;47:378-82. 7. Shafer's Textbook of Oral Pathology. 5 th Ed. 8. Gardner DG. Peripheral odontogenic fibroma: An attempt of classification. Oral Surg Oral Med Oral Pathol 1982;54:40-8. 9. Silva CO, Sallum AW, do Couto-Filho CE, Costa Pereira AA, Hanemann JA, Tatakis DN. Localized gingival enlargement associated with alveolar process expansion: Peripheral ossifying fibroma coincident with central odontogenic fibroma. J Periodontol 2007;78:1354-9. 10. Eversole LR, Rovin S. Reactive lesions of the gingiva. J Oral Pathol 1972;1:30-8. 11. 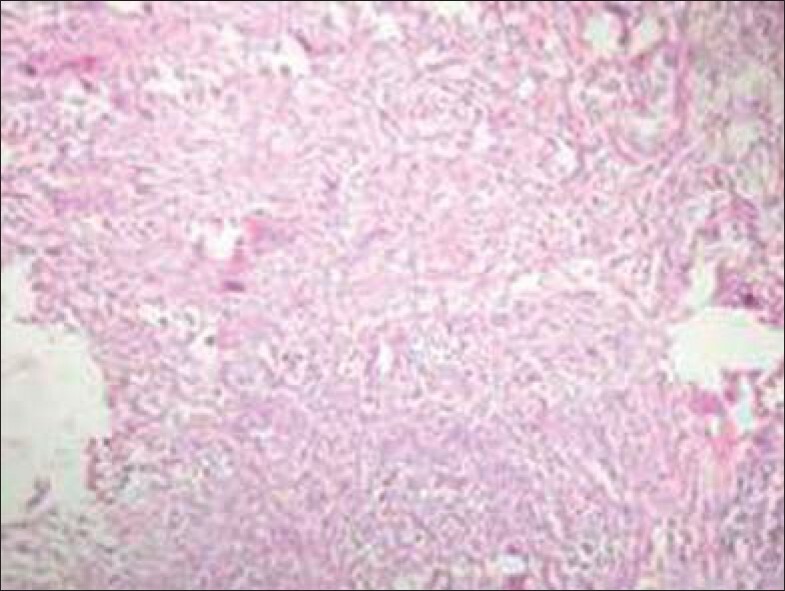 Abitbol TE, Santi E. Peripheral ossifying fibroma - Literature update and clinical case. Periodontal Clin Investig 1997 Spring;19:36-7. 12. Buchner A. Peripheral odontogenic fibroma: Report of 5 cases. J Craniomaxillfac Surg 1989;17:134-8. 13. Walters JD, Will JK, Hatfield RD, Cacchillo DA, Raabe DA. Excision and repair of the peripheral ossifying fibroma: A report of 3 cases. J Periodontol 2001;72:939-44.